Even though dancers can spend weeks, even months, rehearsing before a performance, sometimes the stage, lights and audience can dig up some deep nerves. Maybe there’s a special someone watching, or it’s a premiere of a new piece, or maybe those butterflies manage to flutter unwillingly every time. Nerves are natural and often inevitable, so dancers must learn to ease them, deal with them and to perform well, backed by all that hard work in the studio. Factors that may trigger pre-performance nerves, and the intensity of those nerves, may vary from dancer to dancer and situation to situation. Ashley Laracey, soloist with New York City Ballet, says nerves heighten when she is about to dance a debut part (or if it’s Marzipan from The Nutcracker, a part she says is very difficult and revealing). Sarah Jean Kaye, a professional dancer and aerialist, says she gets most nervous when she performs in front of her students, whom she wants to impress. Anna Liceica, former dancer with NYCB and American Ballet Theatre and now a principal guest artist, says she is usually excited rather than nervous before shows, but there are some exceptions – when she was asked to dance Jewels at NYCB without much rehearsal, or when she performed group Balanchine repertory, because she says there are so many things to worry about. Sarah Braverman, dancer with Parsons Dance, says she always feels a bit nervous before a show but that if she didn’t feel that rush of nervous excitement she’d know she has a problem. Sarah Jean Kaye, a dancer and aerialist, in performance. Photo by Lina Monroy Photography. Each dancer may find different tactics that work to ease nerves, or help channel that positive anxiety. Braverman’s pre-show routine, consisting of Diet Coke, toe tape, exactly one-half of a chocolate chip cookie and 50 sit-ups, helps get her into the right frame of mind. She also makes sure to get to the stage at half-hour to work through trouble spots in the choreography, check her entrances and exits, feel the floor and pre-set quick changes. Laracey’s routine begins with make-up and hair two hours prior to showtime, with country music playing in her headphones. She then eats a banana and warms up, while thinking about the ballet and visualizing how she would like to see herself dancing it, confidently and beautifully. Liceica says that she likes to start her performance day as normally as possible, with class, a bit of rehearsal and a power nap. She also prefers to eat lighter foods and coffee to keep her energy up. 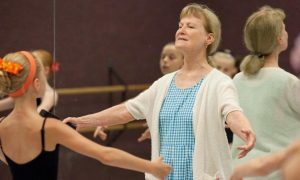 Baugher says it’s important that dancers take care of themselves – body, mind and spirit – and to have faith in their training and muscle memory, and also to think positively. But what happens when, even if dancers settle their nerves before the show, those thoughts, nerves or fears sneak up mid-performance? Most importantly, professionals often say that, despite nerves, or in spite of them, dancers should try to enjoy the special moment on stage. Photo (top): Ashley Laracey, soloist with New York City Ballet, in Peter Martins’ Swan Lake. Photo by Paul Kolnik.